St. James the Great church at Stoke Orchard Gloucestershire stands just a short distance from Tewkesbury and can be reached via the A38 road from which the village is signposted. This mainly Norman church has its origins dating back to circa 1170. 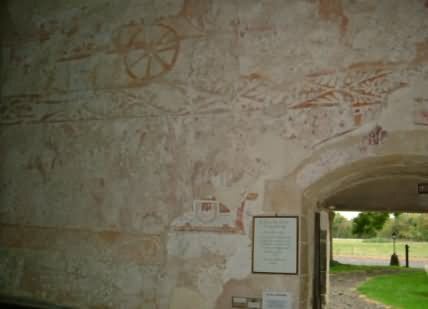 Outwardly there are few indications of the treasures to be seen inside, the building is plain and its walls are partially rendered on the exterior a single bell can be seen, its turret being positioned over the Chancel arch. 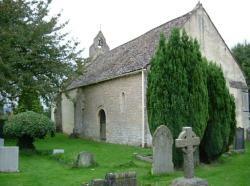 Although it was once a Chapel of Ease to the parish of Bishops Cleeve, it was an important place on a pilgrimage route. 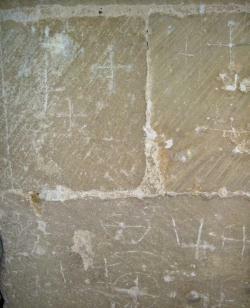 Entry is gained through the south door and it is here that votive crosses of pilgrims are to be seen. These crosses signified a vow. 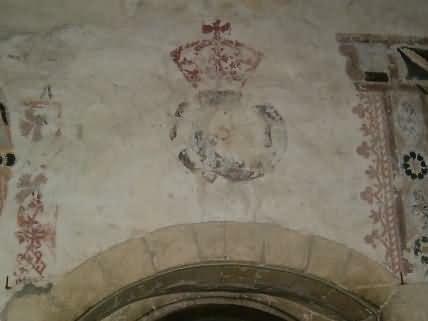 Inside the church there is a Chancel and Nave, the walls are covered in paintings that were discovered in Victorian times and have their origins that date from 1200- 1723. They were restored in about 1889 and again in 1953/55. The decorative borders are unique , they illustrate the life of St.James of Compostella. The last of the 28 scenes depict the souls of St.James and Josias being carried to heaven in a napkin. It tells the story of the Apostle James in which he has an encounter with the wicked scribe named Josias. The animal head designs are believed to have characteristics of Scandinavian origins. The scenes are the only ones of their kind in Europe only a few similar are to be found in some Cathedral glass. They connect the church with the Pilgrim route to the shrine of St. James in Compostella Spain. 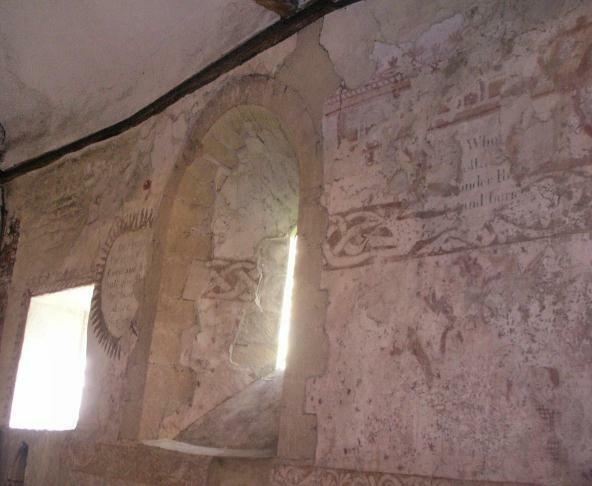 Throughout the church modern illustrations assist visitors to appreciate fully these ancient paintings. In the churchyard there are military graves of the First and Second World Wars. A nearby airfield where glider operations were conducted had a strong connection with the village. The church is open daily during daylight hours.